This blog discusses the steps and configurations to transport Integration Packages using CTS+ based system between multiple tenants by exporting it from one tenant and importing it in another. 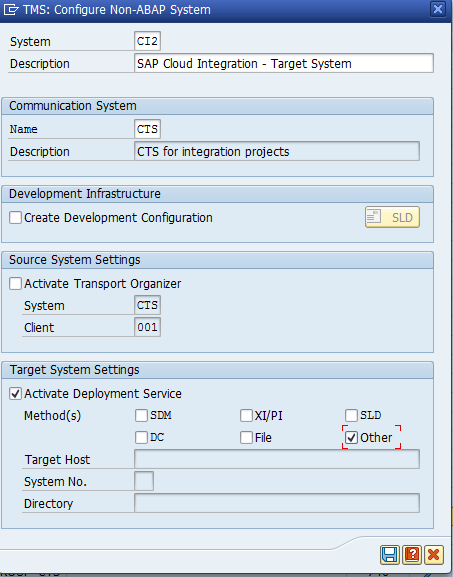 Customers using the SAP’s Change and Transport (CTS+) On-Premise system and having two test and Production Cloud Integration tenants have the option to use the feature to transport an Integration Package from the Test to the production landscape using the CTS+ system. Part 1 focuses on setting up the Cloud Integration for CTS. Part 2 focuses on transport Integration packages across test and Production Cloud Integration tenants. 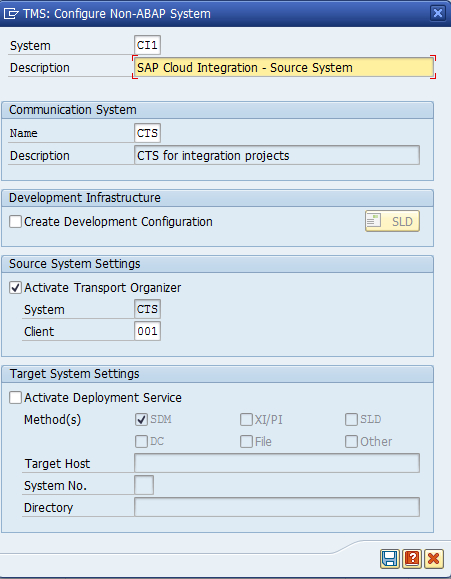 In this part, we will do the necessary configurations to set up the SAP Cloud Integration for CTS. As the Tenant Admin, you will need to enable the Transport Settings to CTS+ in the Test tenant. You can do this by accessing the Settings tab and choosing the Transport Mode to CTS+ Direct. Note: Ensure that all Integration developers who would be transporting content and used for authentication have the Role IntegrationContent.Transport and is a Member of the tenant Account. 2. Enable the service, Solutions Lifecycle Management in your account. In the account cockpit in the SAP Cloud Platform, Choose Services -> Solutions Lifecycle Management -> Enable. 4. 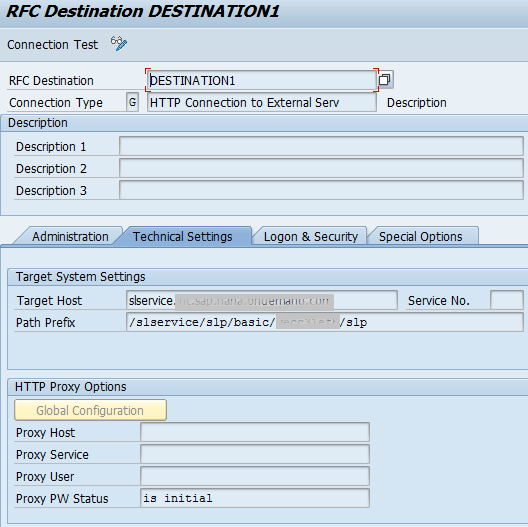 Create a new HTTP destination by selecting Configure Destinations. Ensure that the Name of the destination is CloudIntegration (case-sensitive). Enter the URL of the tenant management node from which you want to transport content. The user credentials that you have used in the destination should be a member of the tenant management node account from which you want to transport content. Note: The Tenant Management URL can be obtained from the accounts cockpit which lists the applications that are subscribed. 5. You have activated and configured the CTS+ Export Web Service as described in Activating and Configuring CTS Export Web Service. To configure the target system, go to SOAMANAGER transaction in CTS system. 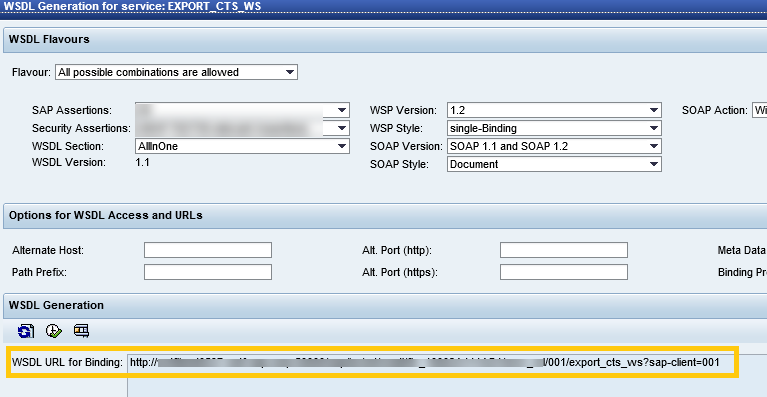 Navigate to Web service configuration and search for EXPORT_CTS_WS. Click on the service. Click on service WSDL generation. Copy this URL and launch in browser, in the bottom of the WSDL is the URL that need to be exposed. For more information on WSDL Document Display, see Displaying a WSDL Document. This URL needs to be configured in Cloud connector, Enter the hostname and port per your requirement. Create a Destination in your account by selecting Configure Destinations, navigate to Login to your account in the SAP Cloud Integration. Ensure that the Name of the destination is TransportSystemCTS (case-sensitive). URL that was exposed as web service (for eg ) from which you want to transport content needs to be configured. The root certificate of the certificate authority that was used to sign the SAP Cloud Integration server certificate needs to be imported in the CTS system. Logon to the Tenant WebUI URL and in the browser, click on the lock symbol. Navigate to the Certification path tab. Import this is CTS system. Start Internet Explorer and navigate to Tools -> Internet options. Go to Content -> Certificates -> Trusted Root Certification Authorities. Select “Baltimore Cyber Trust” and export it as Base-64 encoded .509 (.CER). In the CTS system open transaction “STRUST”. Select the certificate list on the left that you have specified above. 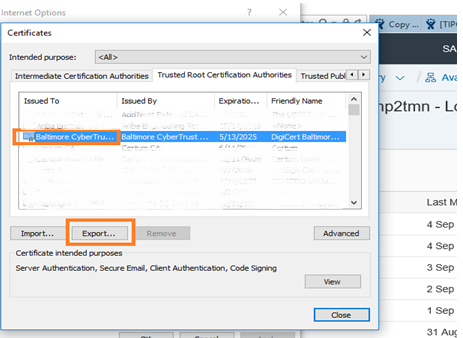 In the dialog enter the file name of the certificate file which has been exported in step 6. Click “Add to Certificate List”. You must create an HTTP destination on the CTS system for every target account (every system where you would like to execute imports). Go to transaction SM59 and create a Destination as shown. Enter a name in the field RFC Destination. 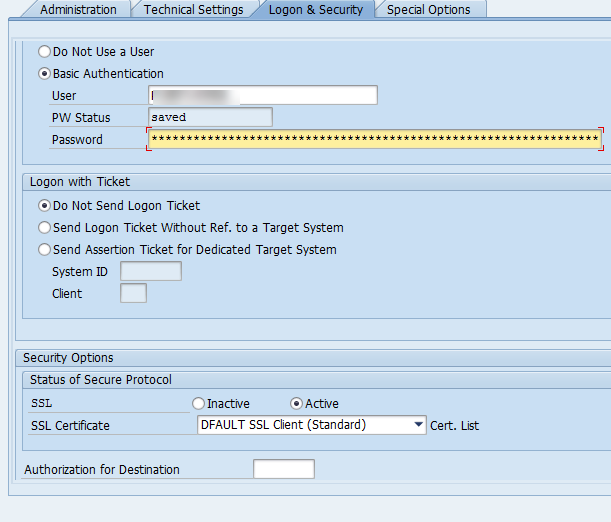 Later, you must enter the name of the destination when you define the target system in STMS transaction. target Host: Enter the data center specific host name of the SL Service. Configure the proxy settings per your network configuration. Go to the Logon & Security tab, enter the logon details for the target system and Make sure to check the “Active” checkbox for SSL. The connection test for the connection should be successful. To use CTS with Cloud Integration, you need to define an application type for Cloud Integration in CTS. The application type will then be used as a unique identifier for Cloud Integration content in CTS. Logon to the CTS system and open transaction STMS. Go to the System Overview. To create a new Application Type, go to Extras -> Application Types -> Configure. You can see the list of application types already created in your system. Choose New Entries. On the next screen, you can enter your application type as “CPI” and a Description. Save your entry and click Yes to distribute the new application type through your landscape. Click Back to return to the list of application types. In this section, we will set up a landscape of two systems, Test (CI1) and Production (CI2), and Transport Routes. Go to transaction STMS in the CTS system and Choose System Overview. Enter the SID of the Test system as “CI1” in the field System and enter a Description. Choose Activate Transport Organizer and click Save. 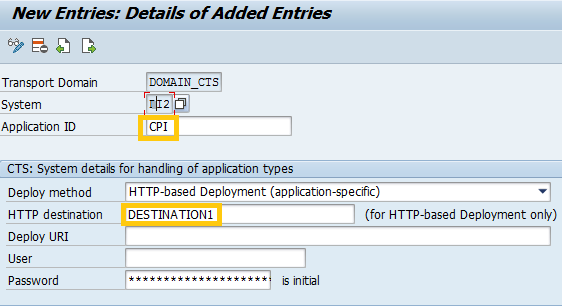 Note: All users that should be allowed to attach SAP Cloud Integration content to transport requests must have a corresponding user in the client of the CTS system that you are using for transports. Click yes to distribute the configuration. 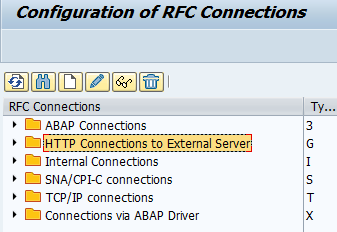 When saving the non-ABAP system, you are asked to define the deployment method for your system. Choose New Entries. Save your entries and choose Yes to distribute the new application type through your landscape. Click back to return to the list. Click Back to return to the system overview. Note: Create any other target system that you might need. With the Transport routes, we connect the representations of different systems we created above. Go to transaction STMS and open Transport routes. The systems created CI1 and CI2 are shown in upper row of systems. The systems in here are not yet connected by transport routes. Switch to Edit Mode. Go to Edit -> Transport Layer -> Create. Enter a name for the Transport Layer, e.g. ZCPI. 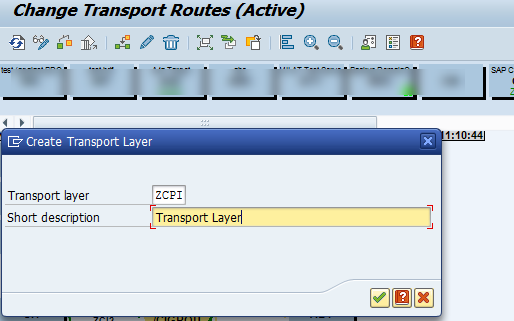 Click on system CI1 in the upper row and drag and drop it in the area where the transport routes are shown. Repeat the previous step for CI2. Your mouse pointer is now a pencil. Draw a line from CI1 to CI2. A dialog box opens. Make sure that Consolidation is selected. A consolidation route is needed to connect a test system to e.g. a Production system (from a system where you do an export to a system where you would like to import the transport request). Enter the Production system as CI2. Choose ZCPI as the transport layer and choose Transfer. A transport route has been added connecting CI1 with CI2. Confirm that you would like to Distribute and Activate the configuration. We have learnt how to configure the Cloud Integration for CTS. We have also done the necessary settings to perform the Transport of Integration packages using the CTS system. In the next part of this blog series, I would extend this set up to perform the Transport of Integration packages across the Test and Production Tenant Accounts. 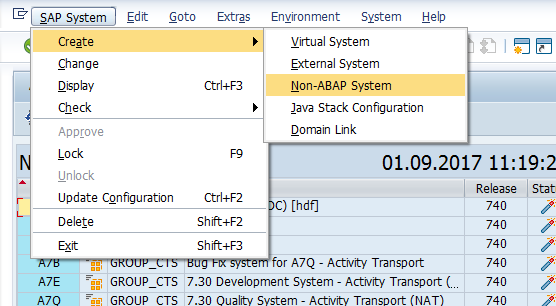 I am trying to transport SAP CPI package using CTS+. I have followed the documentation & I am able to see the MTAR file attached in the transport request generated using CTS system. However when I import this transport request in the target CPI tenant, the transport ends up in return code 4(warnings are not shown) & the integration package does not appear in the target CPI tenant. The connection test is also successful in SM59. Please advise. What is the purpose of cloud connector in this setup ? There are other similar blogs out there where there is no usage of this component. So how is this different. Do i understand right that to enable ‘CTS+ Direct’ .. i.e if the transport request has to be fetched directly when someeone exports the MTA from Dev Tenant, we need cloud connector ? Follow up to 1) , when we push the transport to Quality/Test, will the HTTP destination of the CTS+ system directly talk to Test Tenant on SCP? Here i beleive there is no need of cloud connector? Unfortunately I get the error in SLG1 “Invalid or unknown system CI1, client 100”. Although the system is defined in STMS and the transport routes etc.. Any idea why the system is not recognized accordingly?